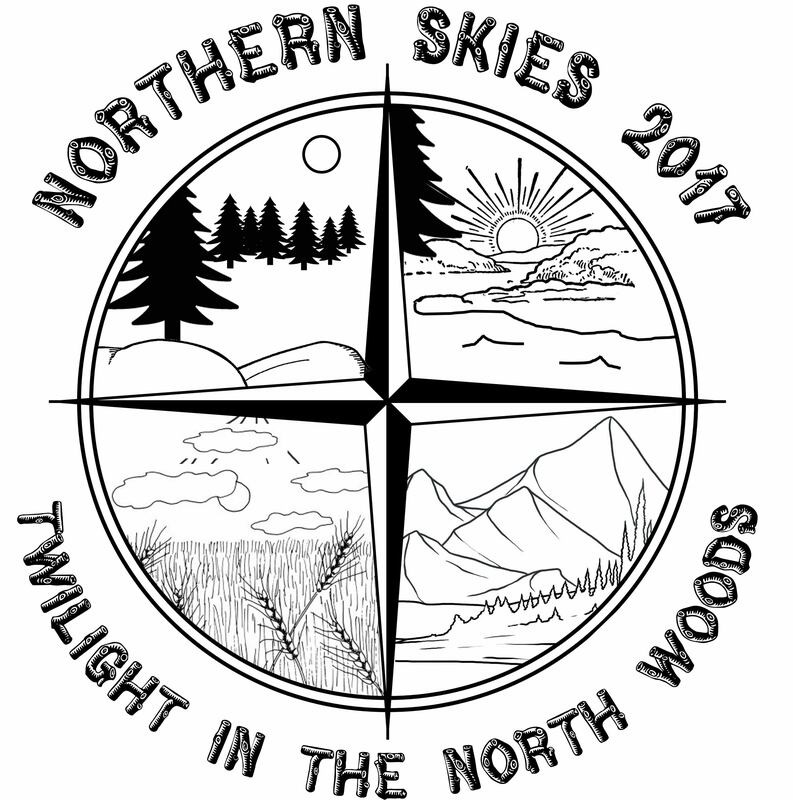 Our theme for 2017 was "Twilight in the North Woods," with activities in camp designed to parallel what you might find in at the cabin, in the north woods, or in an arboreal forect. Our site themes were Lakes, Mountains, Woods, and Prairies. We began each day at the Ceremony Circle. Girls and Caddies arrived and got organized into their units. The Caddies had met the day before to set up, practice, and get ready for camp. After a short flag raising ceremony and opening announcements, the girls headed out to the sites. In the Lakes site we went canoeing, practicing basic canoe strokes and getting comfortable in the water. Sailing is a fun activity on Northwoods lakes, and we made and raced little sail boats in the Rain Gutter Regatta. We made a Worms and Dirt snack and learned about composting and why practicing things like Leave No Trace affects our lakes and water. Finally, we went fishing with the Eden Prairie chapter of Let's Go Fishing. The Mountains site focused on activities we might experience outside the Midwest. We practiced Knots and Lashings, and everyone made a knot card with common knots to practice. We crossed a monkey bridge made of knows and rope, and made para-cord bracelets to have an emergency rope supply. We had atrail mix snack and then learned about appropriate gear to take on a hike. One of the most fun activities was a presentation North Star Search and Rescue did with their rescue dog on how to keep from getting lost and how they help people who are. Getting set up for camp and learning how to set up a tent was one of our fun activities in the Woods site. Logging camps were once all over the north woods, and we really had fun with the Log Rolling activity put on by Carver Parks. For our snack we made Edible Campfires and learned about securing food while camping in areas with wildlife. Fire starting with Flint and Steel was a very popular activity, as we learned about different types of fire lays and the use of tinder, kindling and fuel. The Prairies, at the end of the north woods, was our final site for 2017. Hiking took us around the Prairie Loop Trail at Lake Minnewashta Park. We made and cooked campfire tortillas and learned a little about outdoor cooking. Each camper made her own First Aid kit and practiced basic first aid. Finally, we learned about woods tools, got a lesson in pocketknife use and whittling safety, and then practice whittling making soap carvings. Between the sites and stations, we also sang songs each day, practicing our songs for closing ceremonies. One of the best parts of camp was going swimming at the beachevery day. Each day we finished up on the hill, where we sang our unit songs and had closing announcements. One day a big storm came in and we did our closing ceremonies under the shelter! We also recognized the girls who had earned Bronze, Silver and Gold Awards, and thanked all the Caddies for their work this week. Once camp was over, some of the older girls camped out on the overnight, and finished up with the Older Girl Wrap Party the following week. We already started thinking of ideas for next year! All in all a great year at Twilight Camp!